Moby's Revenge is the latest endless runner game from indie game developer Patrick Ferling, but if the gameplay's familiar it does at least deliver an interesting choice of theme - instead of running as some helpless schlep, you're a whale making a great escape from an aquarium. 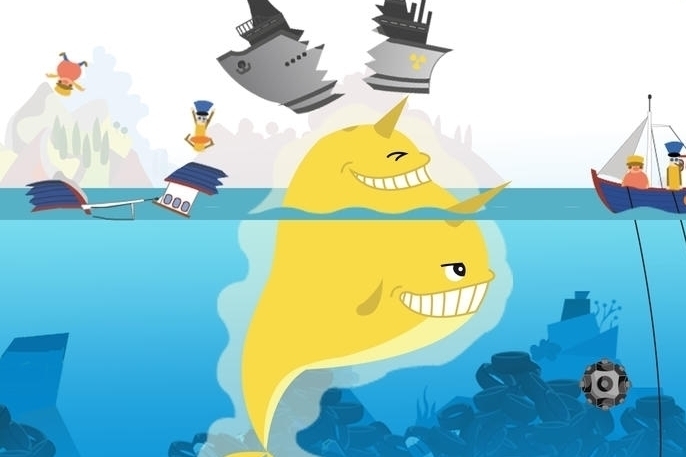 As you avoid all the efforts to subdue your run, you'll pick up helpful power-ups along the way, including a terrific two-headed whale upgrade that lets you destroy everything in your path. Revenge, indeed. Everything about Moby's Revenge feels just about right. The power-ups are fun to use, whether you're collecting Starfish like a crazed animal, or using a mutant double-headed whale to destroy everything in your path. The controls are generally good, but not without their flaws (see below.) As for the presentation, it doesn't set any major leaps forward for the genre, but it's pleasant and fun to watch. Finally, the game's freemium model is well done, and never forces you to pay to play like so many other apps. All the purchases here are optional. The only real negative with Moby's Revenge is the somewhat - and this isn't a pun - floaty gameplay. You hold down your finger to move Moby up, and then let go to have him descend. It's good, but not entirely accurate, and there are times you'll accidentally hit an obstacle because the game didn't respond quickly enough. It's a mild frustration, but considering the more-than-fair freemium model, you'll get over it quickly. For a wonderfully structured free-to-play endless runner, Moby's Revenge fares well in the final analysis. There are occasional glitches and gameplay issues to get over, but everything's good overall and this is a fun game for all ages to enjoy.